Buy a DVD or Photo CD from Stage Door! 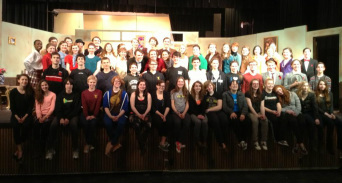 Want to remember the wonderful weekend that the ROHS Drama Club performed "Stage Door" forever? YOU CAN. Just purchase a DVD of the Sunday performance OR a Photo CD ROM of professional photographs from the performance along with backstage and publicity shots. To purchase in person, just contact RODramaBoosters@gmail.com OR if you would like them sent directly to your house, just click the Pay Pal link below to choose DVD, CD ROM and quantity. Net Proceeds go to the Royal Oak Drama Boosters to help put on our next show. Click the buttons below to see contact proof sheets of the photos contained on the photo CD! Shot by professional videographers during the Sunday March 24th performance of Stage Door by the ROHS Drama Club. Ship to your house or arrange for Pickup? If you would like to avoid the hassle of arranging for pickup, for only 3 dollars we will send your DVD's and CD's directly to your house. Just click the button below if you want to take advantage of this. Otherwise, just e-mail rodramaboosters@gmail.com to arrange for pickup when they are ready after Spring Break.